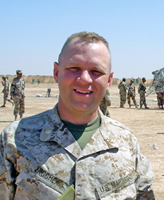 Like many other veterans, Michael Zacchea ’90 returned from service in the Iraq War after an injury and struggled at times to readjust to life outside of the military. Now, he is helping other disabled American troops on the same return journey to civilian life. Zacchea was wounded by a rocket-propelled grenade in the Second Battle of Fallujah in 2004, one of the bloodiest battles of the war. He was medically retired with the rank of lieutenant colonel, earning the Bronze Star Medal for Valor and the Purple Heart for his service. During his time in Iraq, Zacchea trained the first Iraqi Army battalion to enter combat in the war. In 2009, while studying for his M.B.A. at the University of Connecticut, a professor referred Zacchea to the Entrepreneurship Bootcamp for Veterans with Disabilities (E.B.V.). He went through the program and now does outreach for it to disabled vets. UConn is E.B.V.’s New England center. Zacchea also is involved with ConnectVets, Inc., an organization of veteran-owned businesses in Connecticut. The group represents the interests of veteran-owned businesses in the state. Zacchea, who graduated from Notre Dame with a degree in English and classical civilization, says his Notre Dame College of Arts and Letters experience helped him train Iraqi troops. The entrepreneurship bootcamp involves three phases: the first is an exercise in niche marketing, focusing a disabled veteran’s business idea on a specific market; the second is the “residential learning phase,” an intensive eight days with 80 hours of instruction and 40 hours of homework to develop a “value proposition” and build a business plan; and the third is a year-long mentorship. The E.B.V. has spawned a long list of veteran-owned businesses. Among them are an investigative services company and a military apparel supplier, ideas that one might expect from ex-military men and women. But also included on the list are a digital design company, a company that creates personalized letters for children from Santa Claus, and one business that specializes in releasing white doves into the air for weddings and funerals. After returning from Iraq, Zacchea went through the day-to-day ups and downs of post-traumatic stress disorder, which many veterans face at home. Speaking from a conference in Washington, D.C., on disabled returning vets, Zacchea says a veteran’s hardest task is often just dealing with his or her injuries. According to the Associated Press, through May 2012, 45 percent of the 1.6 million soldiers that have served in Iraq or Afghanistan have applied for disability benefits. Clearly, the work Zacchea does grows more important by the day. Originally published by Scott Frano at al.nd.edu on August 16, 2012.